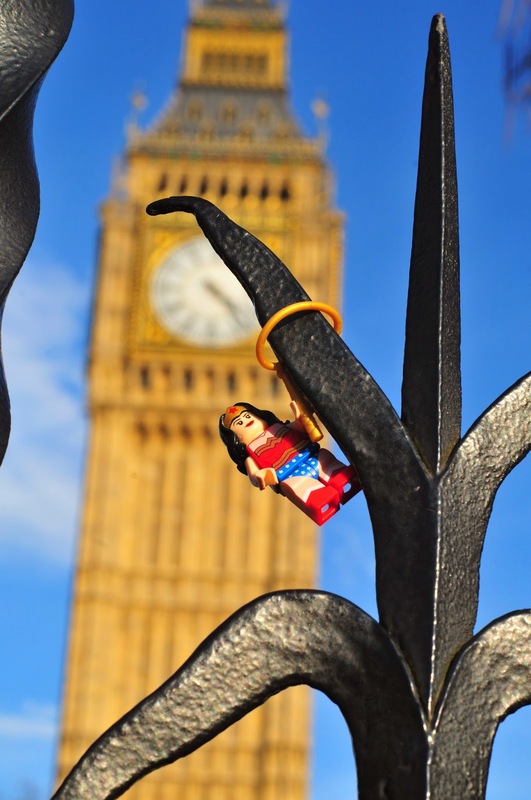 moments of perfect clarity: guess where wonder woman and i went? a fantastic weekend in london. a bit of shopping (mostly involving me sending photos to the child to see whether she wanted various items - what did we do before iMessage? ), hitting some bookstores (the wonderful foyle's and an enormous waterstones near picadilly), walking with lizzi (you may know her from many steps sideways and do go check her blog, as she wrote about our day much more pithily than i will) until our feet were nearly bleeding, some legography at big ben and parliament square, lunch, starbucks and a last-minute inability to stop myself from going into the gap (like google, apple and the new york times, they just get me). all of this and glorious sunshine, cherry blossoms in full bloom and a surprisingly delightful stay in a little radisson blu edwardian just off oxford street, not to mention a workshop and meeting some really wonderful lego enthusiasts who were generous in sharing their ideas. in all, it really couldn't have been a better weekend (except that my feet are still a bit reluctant to speak to me after i subjected them to nearly 12 hours of tromping around london in doc martens (so much for those cushiony air soles). i know i've been a bit absent here in the past week. i was fighting off a cold and that left me zapped for energy. plus i've been reading a good book (popco by scarlett thomas) and watching a few too many episodes of fringe. but i can feel that i'm missing my daily writing! blogging is, after all, cheaper than therapy and nothing else quite does the trick for keeping me sane like sending all those thoughts which tumble around in my head out my fingers right here in this blogger compose space. so i hope to be back on form this week. for all of our sakes. oh, and catwoman had to come along too and see the london eye. she nearly blew off into the thames, but i grabbed her in time. that would have been a tragedy. i can't get enough of the story of the lost malaysian airlines plane. will they be found safe and sound? isn't it a job for james bond at this point? I read Lizzi's blogpost yesterday and saw what you were up to! I am glad you had fun!AriadnefromGreece!